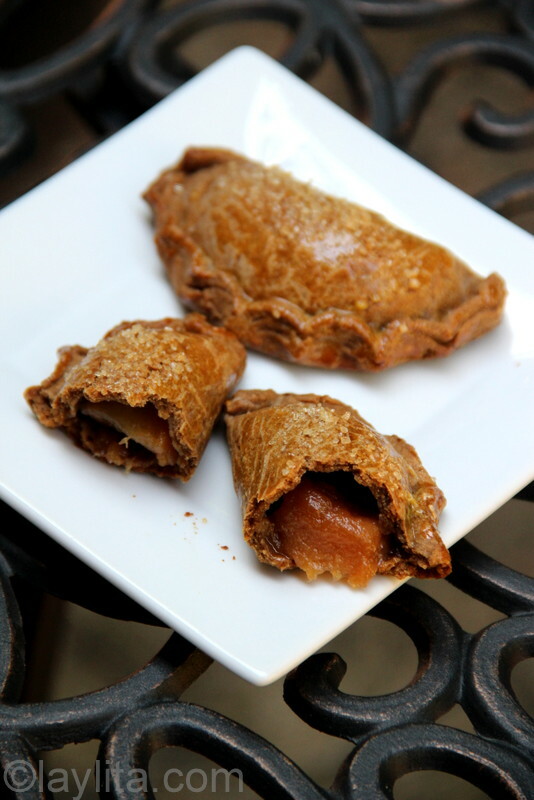 These delicious pear empanadas are one of my most recent empanada experiments and have quickly become the most requested dessert empanadas I’ve made. I have to thank my friend Thomas for these empanadas, his family owns an orchard, Crystal Springs Orchard, located in the Entiat Valley in Eastern Washington, and he was kind enough to bring me some of their beautiful pears. In fact, he dropped them off just days after I got home from Ecuador. Let’s just say that I got over any jetlag from the trip by jumping in the kitchen and making a lot of different dishes using pears (of course some were just enjoyed as is). Pears are a versatile ingredient that can be used in many dishes, from desserts to savory appetizers to salads to drinks. My neighbor just brought me some apples from her tree, so you can guess what my next recipe experiments will involve. 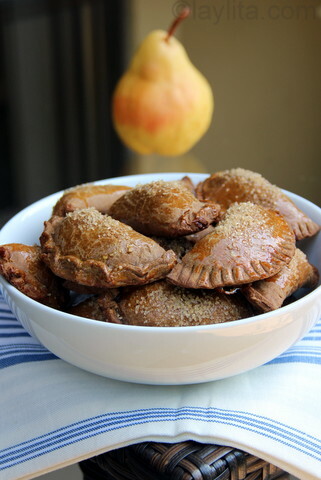 Gingerbread empanada dough filled with caramelized ginger pears that were cooked in a syrup of panela or piloncillo and spices. 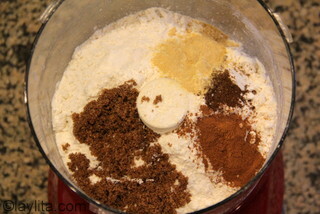 Place all the dry ingredients: flour, brown sugar, dry spices and salt in a food processor and mix well. 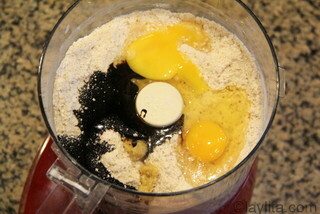 Add the eggs, molasses, freshly grated ginger and 2 tbs water, mix until a clumpy dough forms. 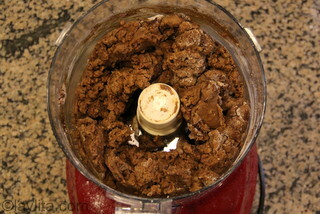 Add the additional water one tablespoon at a time if needed. 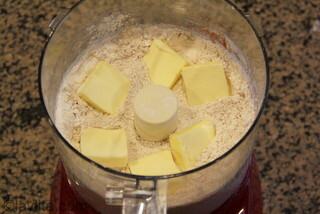 Remove the gingerbread dough from the food processor and knead it a couple of times. 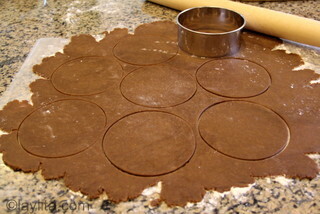 Cut out round disc shapes for empanadas, use a round dough cutter as a mold or a small plate or cup that you then use a knife to gently cut around. Choose how large based on whether you want small or medium sized empanadas. 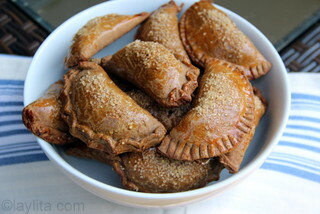 For sweet empanadas, I usually make them smaller so that you have the perfect size for dessert. It also makes the empanada assembly easier if they are small. 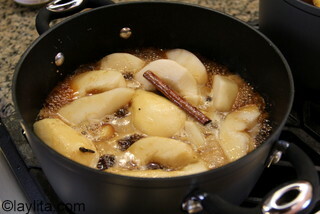 In a large sauce pan, combine the water, panela or piloncillo (whole or grated), cinnamon, ginger and cloves. 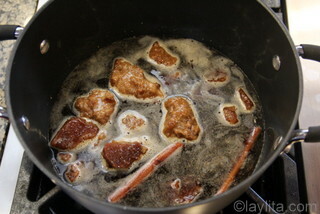 Cook over low heat until the panela or piloncillo has dissolved and you have a syrup. 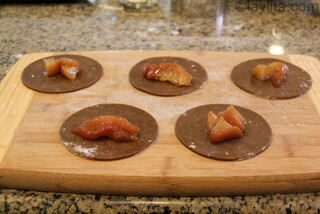 Place a spoonful of the ginger caramelized pears on the center of the empanada disc. Brush the edges of the empanada disc with the egg whites; this will act as a form of glue that will help seal the empanadas. 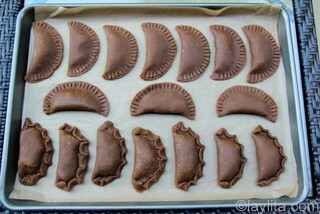 Fold the empanada discs and seal the edges gently with your fingers. 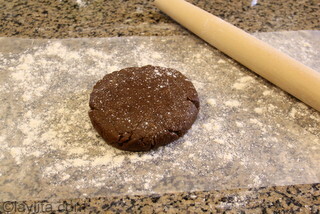 Sweet empanada dough is more fragile than savory empanada dough so you can try to twist and fold the edges of the empanadas with your fingers, but it’s much easier to use a fork to seal the edges. 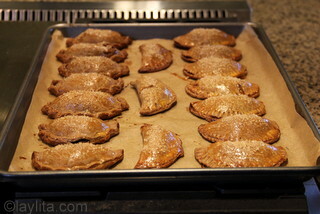 Lightly brush the top of the empanadas with the egg yolk wash; this will give them a nice golden glow when baked. 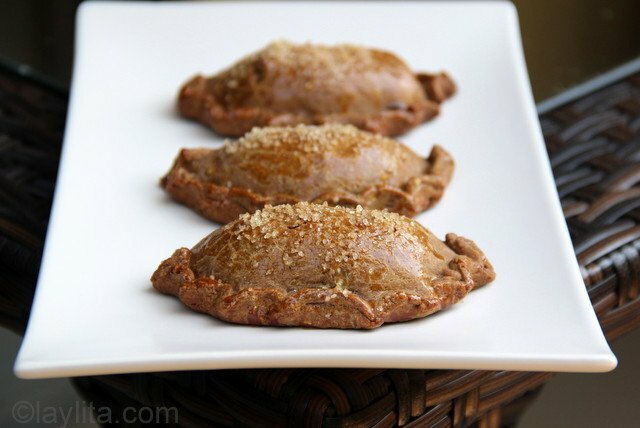 Serve the pear empanadas warm. They are still good served cold, but taste much better when eaten warm. There is something about the smell and taste of gingerbread that is very comforting, maybe it’s because it triggers warm memories of the holidays and those days where it’s so cold outside that all you want to do is just stay inside next to the fireplace sipping something hot. These empanadas are an instant time machine that transported me back to childhood memories of making gingerbread cookies with my brothers. 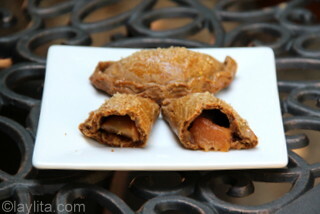 Of course, the gingerbread pear empanadas are even better because they are filled with sweet caramelized pears. 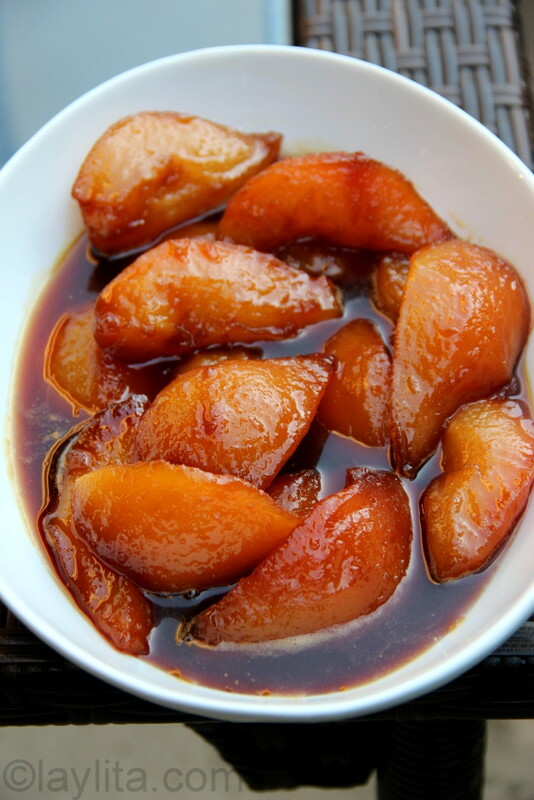 I’ve poached pears many times and they are a very fragile fruit that requires gentle care, so I was unsure about how pears would work when I tried to cook them in a syrup of panela or piloncillo, an unprocessed brown sugar, as there is heavy boiling involved. In Ecuador, we use the term “dulce”, translates as sweet, to refer to fruits cooked or caramelized in panela syrup. I am very familiar with cooking fruits in dulce de panela, but it’s usually done with fruits that are hardier, such as squash or pumpkin, figs, pineapple. 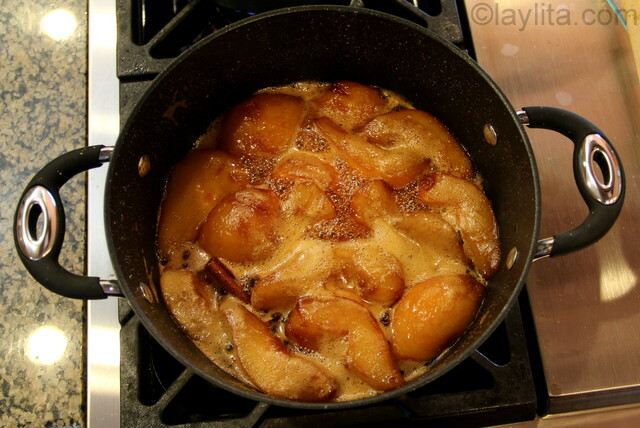 However, my pear dulce turned out wonderful, the secret is to make sure that you don’t stir the pears once the syrup starts to boil. Most dulces have spices in the syrup, but the spices don’t usually include ginger. 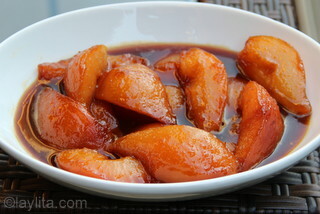 These ginger caramelized pears could also be served as a dessert on their own. 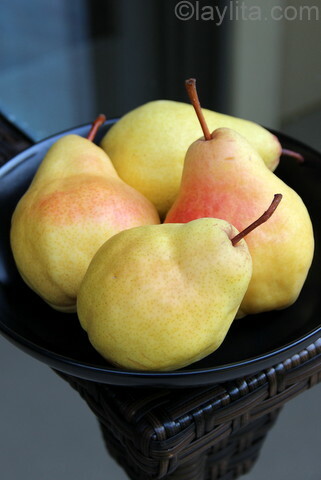 You will likely have some leftover pear dulce; I recommend serving them with some vanilla ice-cream or using them as a topping for pancakes or waffles. Is there anything that we could use as a substitue for panela or piloncillo? I haven’t had any luck trying to find them in my area. Hi Brie – You can use brown sugar as a substitute. You can also probably order panela/piloncillo on Amazon. These are absolutely delectable! I’m more of a cook than a baker, but had no problems with this recipe. The filing is very inspiring for other recipes. I will most certainly be making other empanadas or ‘mini pies’ as they have affectionately been dubbed in the house. My wife and I invited a friend over to make these together–they were outstanding! 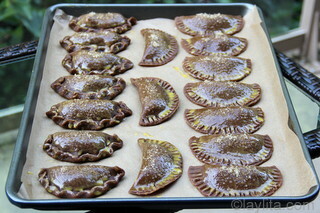 We enjoyed them even more than the strawberry rhubarb empanadas that Laylita published years ago. We followed the directions and ingredients to a tee. We actually ended up with extra dough, not extra pears. Luckily I had bought eight pears. 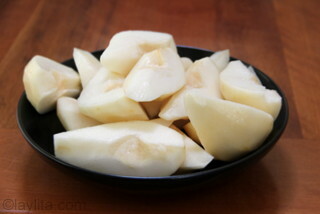 So after we finished the first batch of empanadas, I reused the syrup and simmered a second set of four pears. 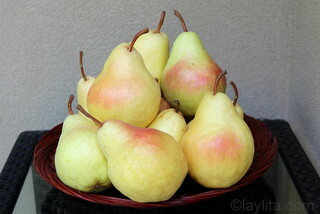 We used 3 of the four extra pears for a total of seven medium-sized pears. One other thing to note is that Laylita didn’t give any specific size guidelines. We found that a 4 1/2″ diameter empanada was just about right and actually used a plastic Rubbermade container to cut them. The Rubbermade happened to be the perfect sharpness and worked beautifully. Hi Jeff – Thanks for the feedback. Love the suggestion to use a Rubbermaid container to cut them. The size of the empanadas in the photos is 3 1/2″. These look and sound incredible! Mmmm! Beautiful photos! Me gusta muchoooooo! Perhaps with a little scoop of vanilla ice cream? what a great idea! I love ginger & pears. I imagine the flavours would be very special. I’m going to try and veganize these empanadas. Do you think coconut sugar would replace the panela? I’m possibly going to Ecuador in January. Do you have any recommendations for which city to make my base? Hi India – Panela is vegan, it’s just boiled sugarcane juice, so you should be fine (here’s a post that explains how it’s made:https://www.laylita.com/recipes/2012/03/03/what-is-panela-or-piloncillo/). For Ecuador, I would recommend either Cuenca or Quito, both have good transportation (flights/buses) that make easy to visit other cities, and are beautiful cities. If you are looking for a smaller laid back town then Banos or Vilcabamba are good options.